TVS Dazz equipped with engines a capacity of 109.65 cc, 4 stroke, SOHC, air-cooled, which is capable of producing maximum power bhp 8.34 (6.14 kW) at 7500 rpm with maximum torque of 8.3 Nm at 5,500. rpm. This machine uses technology low friction over square engine that is claimed to be more powerful and fuel efficient. TVS Dazz has a long dimension of 1,875 mm with a width of 675 mm and height 1,050 mm the axle spacing 1.240 mm with a weight of 92 kg, for a fuel tank capacity of 5.3 liters of the largest class. For the front suspension using a type telescopic shock absorber. and rear suspension using a type single shock absorber, for braking systems TVS Dazz equipped with front brakes discs 200 mm and 130 mm rear brake drum. For the electrical system TVS Dazz using electric and kickstarter, battery maintenance free 12V 3.5 Ah and the type of spark plugs UR4KC. For system security, TVS Dazz equipped with a brake lever lock that is located on the left handlebar, with this feature motors will remain stable when stopped or parking on the street is uphill or downhill. 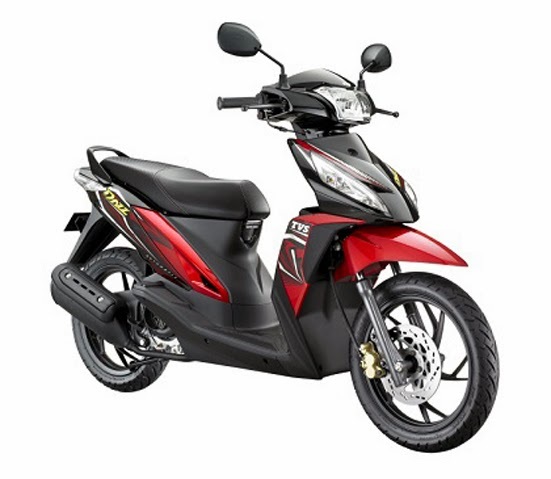 TVS Dazz is available with a choice of 3 colors namely New Volcanic Red, Bright Green and Dazzling White, and equipped with features mobile phone charger and also tubeless tires to provide comfort to the rider.